Robert William Barker was born on 29th July 1875 and baptised on the 7th June 1876. He was the son of Arthur Barker a Merchant’s Clerk of East Dereham and Martha Ann Platten daughter of Carpenter John Platten. They were married at St Andrew’s Church on November 1st 1874. 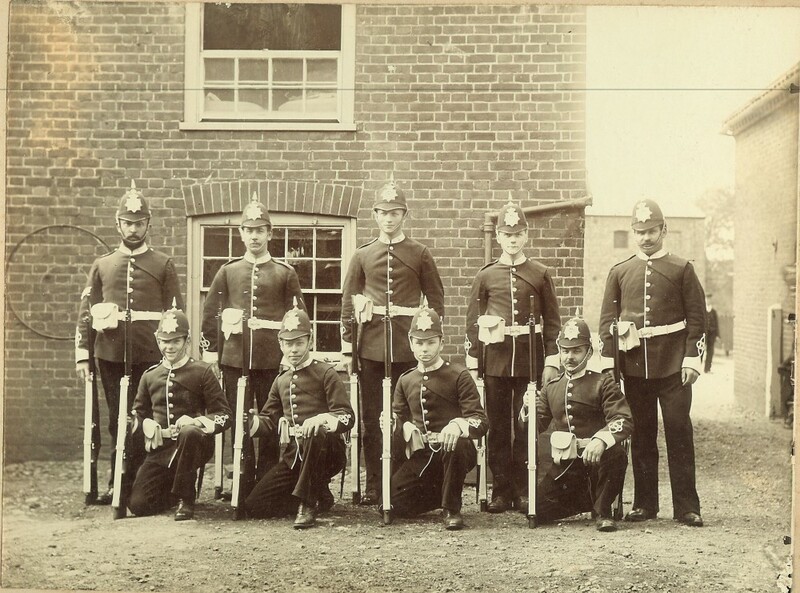 His involvement with the 3rd VBNR means that his image has been captured on at least two photographs of the period in uniform once in 1894 where he is back row centre. 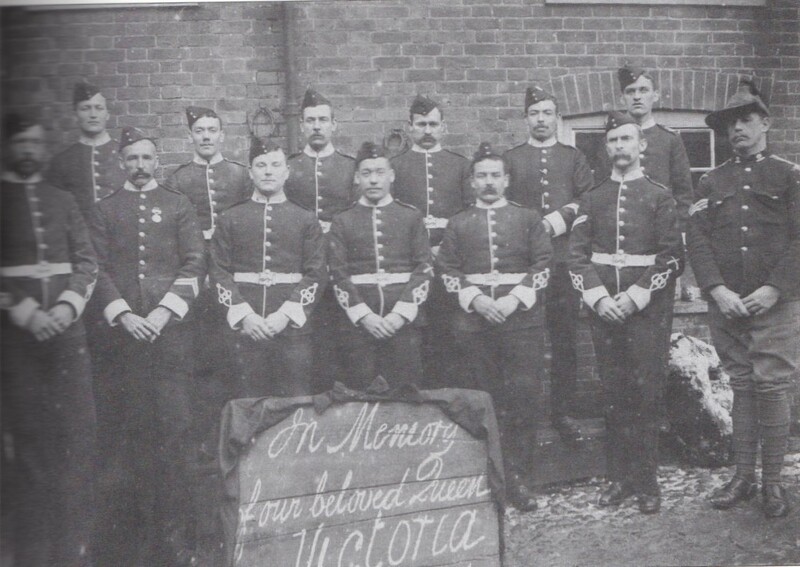 This photograph is part of the archive held at the Gressenhall Museum and has just four names penciled in on the back. 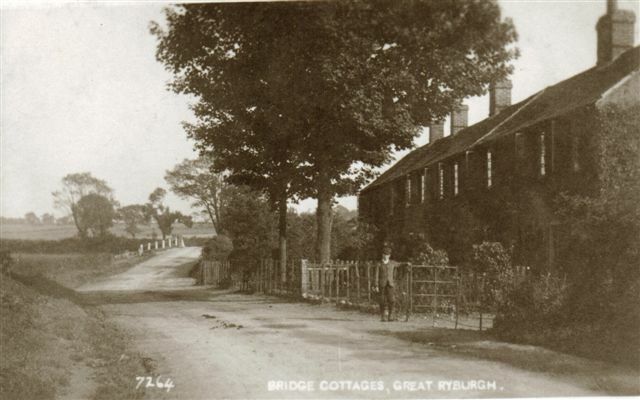 The 1911 Census shows that after his marriage to Maud Rush daughter of Boar Licensee, Frederick Rush in 1905, they relocated from Malting’s premises near to the Crown in the Fakenham Road, to the cottages (No 3) in Bridge Road owned by Ryburgh Farmers' Foundry Manager, Tyrell Cooke. 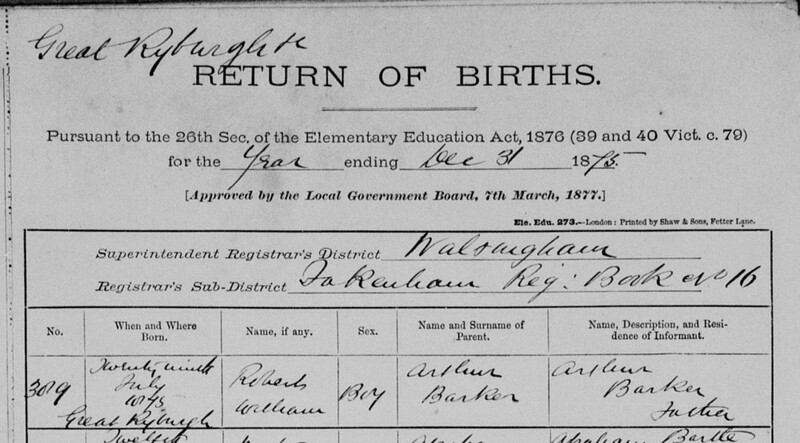 The 1911 return doesn’t list Frederick William the eldest of the Barker’s children at Bridge Road, only his younger sister Rhoda Maud and also Robert William’s younger brother Arthur. 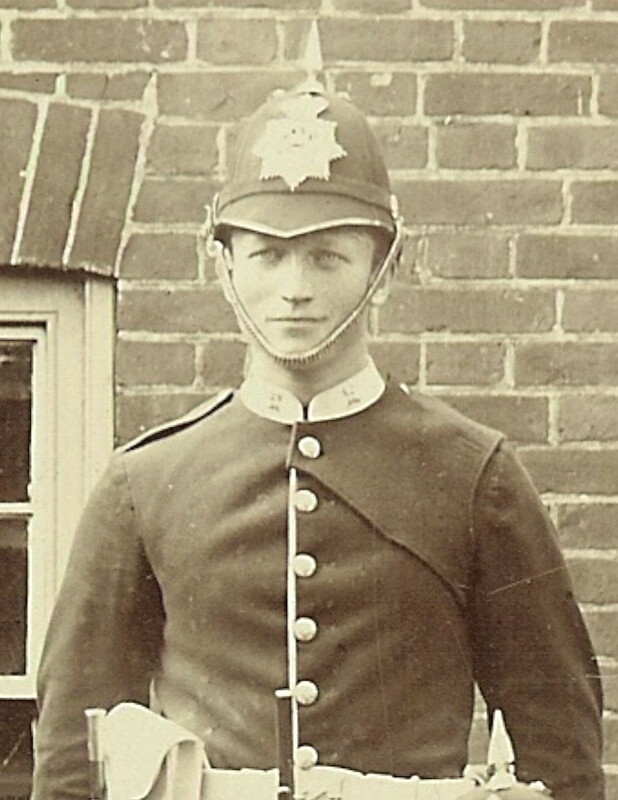 Instead young Frederick was living with his Great Aunt Mary-Ann Salisbury at Stanley House (now a part of the Maltings Offices). After she was widowed in 1906 F&G Smith purchased Stanley House in order that the wife and family of one of their most trusted employees William Salisbury could continue to live in comfort. Robert William’s mother and Mary Ann Salisbury were sisters, the daughters of carpenter John Platten whose father John Platten Snr had kept the Boar in the 1830’s and 40’s. and farmed at Hill farm Little Ryburgh. 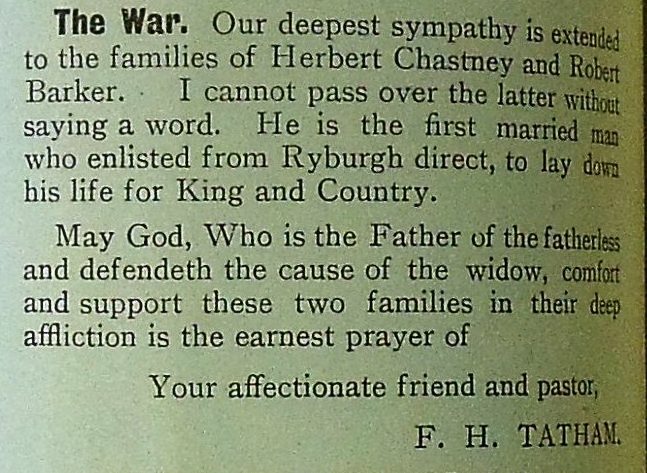 This family link meant that RW Barker and R.R Platten on the War Memorial were second cousins. Robert’s working life was inevitably linked to the Smith family, his employers and landlords for much of his life. His occupation was as a Miller according to the 1911 Census at the F&G Smith's Steam driven Roller Mill adjacent to the Mill House. It was his close family ties with Smiths that probably obliged him to volunteer to learn to ring the new bells when they were installed in 1891. 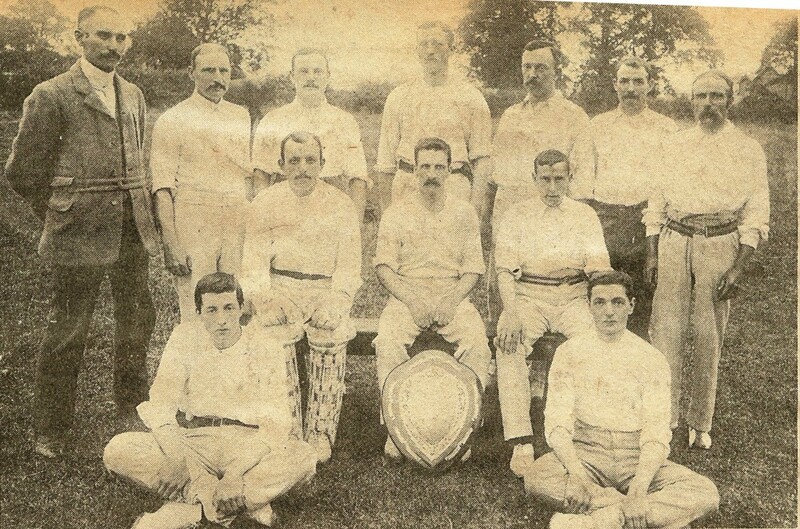 He seems not to have continued very long in that capacity and was probably better known as a local cricketer, playing in the winning team in the recently inaugurated Mid Norfolk Cricket Shield competition in 1904. Curiously, at the time of his enlistment he had become a groom and gardener for the rector, Revd. F.H. Tatham. I am informed by the War Office that application should be made to you with regard to any articles of private property belonging to the deceased Private R.W.Barker 2nd Northants Regt. He was killed in France on March 4th1917 and I have been informed by the Adjutant of his regiment that certain things belonging to him (R.W.B.) have been forwarded to this country through the usual official means & I hold a list of them on behalf of his widow. Would you kindly let me know on her behalf whether you have received them or not & when if so she may expect to receive them? I am more especially interested in this case as the man in question used to be my gardener etc. “Any who wish to subscribe can send their donations to me or the collectors, Mrs. Alfred Neale and Mrs. R.W.Barker of Riverside (now Bridge) Cottages. However small the contributions may be they will be thankfully received and any who desire to be anonymous can intimate the same to me and I will see that their contributions are so treated.” F.H.T. 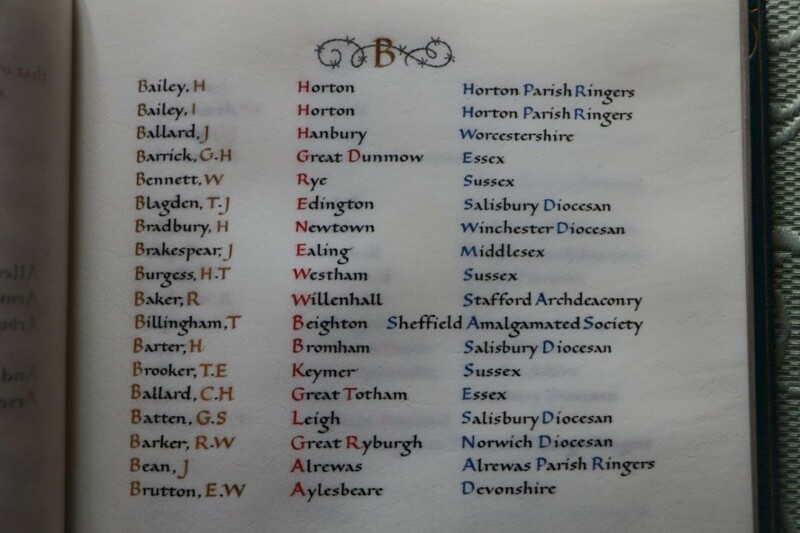 Robert Barker, as a probationer member of the Norwich Diocesan Association of Ringers from 1891, has recently been added to the Roll of Honour of the Central Council of Church Bell Ringers. The Great War Memorial Books are kept at St. Pauls Cathedral in London and the page below is reproduced by kind permission of the Steward of the Rolls of Honour, Mr. Alan Regin. Alan rang in the peal for Harold Douglas Palmer Comer in 2015 and will be ringing again as we remember Albert Green on August 1st 2016.